How to Read Structural Steel Fabrication Drawings - Rosh Metal Ltd. How to Read Structural Steel Fabrication Drawings - Rosh Metal Ltd.
Reading technical structural steel fabrication drawings can be a rather difficult task for people outside the industry. However, regardless of what they may seem, all technical drawings must be clear, to people trained to read them of course, and very to the point. After all, they are a “language” which people who plan and people who execute those plans rely mostly on for communication. To bring the point closer to home, remember the first time you were reading an actual contract. It seemed puzzling and purposely made vague in other to deceive, but it is very likely that it was simply written in the legal register; hard to understand for people outside the field, but A-B-C for lawyers. In that sense, technical drawings can be seen as a register of their own too. People making them and people reading them understand perfectly well what is going on, and for the sake of lives and property they must do anything but, while other not so much. In this article, we will endeavor to clarify a few points about structural steel fabrication drawings based on a few examples. The most basic skill necessary for reading and making structural steel fabrication drawings is being able to tell how much things are far away from each other, what is the length, width or height of a certain segment of a mechanism, or the mechanism as a whole. First of all, it is important to know where to put the mark. Take a look at the image sections marked by a red number one. On the right, you can see the vertical line designating the right side of the mechanism. If you look more closely, you can see that the vertical line is in the same line as the outer part of the end plate. This is a very important detail as this indicates that the length expressed on the drawing includes the outermost irremovable point of the mechanism and whoever is supposed to install the elevator knows that there are no extra lengths or margins to be taken into account. 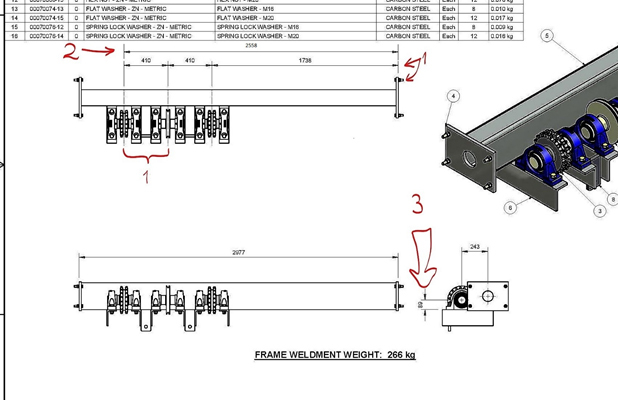 While it is extremely unlikely that someone doing the structural steel fabrication drawings will make a mistake of putting the vertical line above the middle of the endplate and express the length from that middle point thus leaving the constructors to guess, it can happen sometimes that the planners express the proper length but put the vertical designator in the middle and leave the constructors guessing again. Now, moving on to the number one on the left side of the image. As you can see here, the vertical designators are not on the outermost end of the gear, but rather in the middle. This is a common practice when marking round objects, or other objects with a diameter, or simply objects whose size is irrelevant to the mechanism as a whole. What this segment tells us is that if the gear mechanism is put 2558mm away from the outer point of the endplate, there will be no overlaps and everything will be as it should be. The reason why we know that these are millimeters we are talking about, aside of course from common sense – 2558 feet or meters long mechanism is non-existent, is down to convention. All the length and width units will be expressed in metric units in millimeters unless specifically marked otherwise. Marked by number two is a length measurement added by the author for illustrative purposes, it was not part of the original drawing. It is there to illustrate the hierarchy of distances in a drawing. Normally, there would be no special drawings for different segments of the mechanism and their dimensions at this level of detail but the planner would first enter the total distance of the mechanism in question and then add smaller distances inside it. This is normally done so in order to funnel the focus and bring the attention gradually from the whole picture to finer details. Finally, number three points to the arrows and to an interesting deviation out of practical reasons that show us what happens when there is no room to express the dimensions with the arrows inside; it is simple, put them outside. Aside from the simple length markings, there are many other symbols that can be seen on structural steel fabrication drawings, depending on the type of assembly and material. ∠ – this, for example, is an angle symbol showing under what angle should two pieces be merged. While it may be a source of confusion for some, very frequently, in big assembly processes, pieces that come in large quantities can all be marked the same way. For example, in structural steel erection processes, it is the case that constructors will use multiple absolutely identical columns as far as their shape, purpose and make are concerned so they will be all designated the same way (e.g. C1 for all corner and wall columns, but C2 for the center column). While it is hard to imagine that after this short intro you would become a planning expert or a constructor, we hope that this has answered some of the questions that you previously had about structural steel fabrication drawings, bearing that you have been in direct contact with one before. As far as more detailed coverage is concerned, we invite you to follow our page and stay tuned for some future articles covering this topic.